Today was quite the full day!! Woke up at 6:00am and had breakfast (fried eggs and toast). 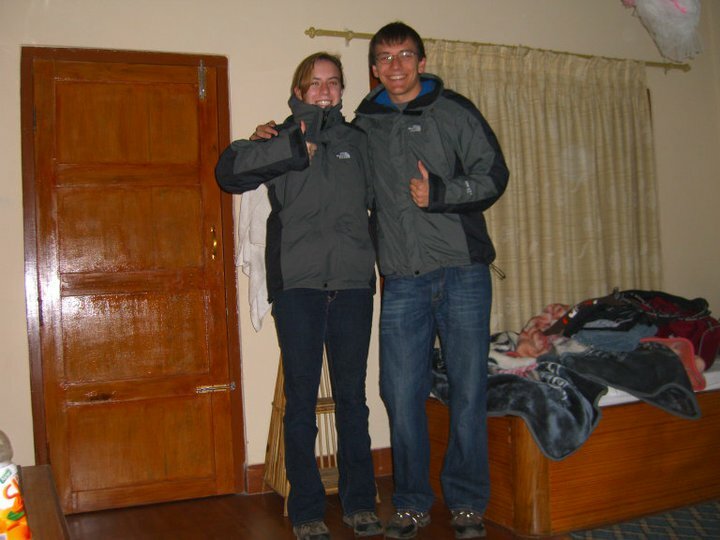 It was pretty cold in the morning so Steve and I wore our new winter jackets that we had bought in Kathmandu. Us in our matching jackets ready for canoing. Just for the record, I found this jacket first. Then Steve goes, "Oh that's really nice I think I'll get one of these." Then after reviewing the color selection (basically Steve had a choice between maroon or grey and I could only choose grey in my size) we ended up buying the exact same jackets. I know, embarassing. Don't worry, I remedied this problem later in the trip. Gobind and this new hotel guide guy Ishna met us at the front of the hotel. Me, Steve, and this Asian man name Kim were really the only ones at the hotel that day. So the five of us, led by Gobind and Ishna walked down the dirt road to the canoe launching place. It was really foggy and cold outside and the river was letting off steam. The canoes were massive, all dug out of trees. Me, Steve, Ishna, Kim and Gobinda all climbed into one canoe. There was a guy standing on the back edge of the canoe with a stick of bamboo about eight feet long. When we were all seated, he pushed us off the shore and jumped to his spot standing on the back. We glided onto the water and headed into the mist. It was eerily quite out on the water. Ishna pointed out a ton of different birds along the way. Lilly pads floated by. The movement of the canoe, my lack of sleep, the warmth of my knock-off Northface coat, and the silence and sounds of the surroundings started to put me to sleep. Then Ishna spotted a crocodile. Well that woke me right up!! At the begining of the canoe ride they said it would be very unlikely to see any crocodiles because of the cold weather. I guess we were lucky because we saw this one creeping in the water with only his eyes and crocodile forehead visible. When he noticed us he dissapeared under the water. Ishna using binoculars to spot some birds. After about 45 min the canoe brought us to shore. We were now on the other side of the Rapti River. We got off the canoe and onto the Chitwan National Park land. Gobind and Ishna were taking us on a jungle walk. Ishna prefaced the walk saying that we shouldn't expect anything because many of the animals are rare and live much deeper in the forrest. But just in case he said we should walk carefully and quietly so as not to scare any animals that might be around. This was legitament jungle land. Leaves, vines, trees, and plants were everywhere. There weren't really trails, mostly just animal paths that we walked on. Ishna told us about all the stuff we saw. He described how one type of vine was kind of taking over the vegetation of the jungle and it was bad news for the other plants. We saw a ton of birds and Ishna showed us these little red bugs that covered the leaves of certain plants. Ishna explained that the bugs wouldn't bite because the weather was so cold that they were kind of in a state of frozen hibernation. Observation tower in the middle of the grassland place. We went to an observation deck thing in the middle of the grasslands and looked around. Gobind showed us a bush full of berry things. Apparently they are the sloth bear's snack of choice. Ishna and Gobind immediately started eating the berries. They offered us some. Steve tried half of one then the thought of getting sick prevented him from eating any more. I ate about 18 of those little berry things. At first they tasted like cheese and pear (weird) but then as you ate them they became a lot sweeter. I thought they were pretty good and don't worry I didn't get sick to my stomach later. We saw a wild boar in the path of the grasslands, a ton of deer grazing around, some butterflies, and tons of colorful birds like woodpeckers and king fishers. As we walked around and the sun came up it got a lot hotter. By the end of the jungle walk I only needed a t-shirt, no jacket or sweatshirt. After about two hours of jungle exploration we got back in the canoe (which magically appeared exactly when we needed it) and headed back to the hotel. We had about 15 minutes to rest before lunch. Lunch was chicken, ketchup, pork, noodle, clementines, carrot soup, and milk tea. After lunch we had some free time so Steve and I decided to check out the Elephant Races again. The hotel arranged for a truck to drive us there this time. We had just missed the actual elephant races again but we were just in time for the elephant beauty pageant!! Six decked out elephants all ready for the beauty pageant!! Look at the little guy on the left, just a baby!! The beauty pageant elephants were painted with tons of different designs. They all had these cloth head pieces with fringe on the side. Some of them wore big brightly colored cloth saddle things. Their riders were pretty serious about this contest and so was the crowd. There was a panel of judges that would inspect each elephant. The elephants had to stand, sit, then stand up again, lift one foot and then wait to be dismissed. The judges would also check behind all the elephants ears. Steve said he thinks it must be like in dog shows when they check the dog's tail. Due to my lack of dog show viewing, I had no idea haha. Elephant with some random designs painted on him. Best seat in the house to see the elephant beauty pageant. A little boy selling peanuts at the Elephant Races. Apparently in Nepal, handle bars count as a kids carseat. Me and Steve walked back to the hotel and checked out some shops along the way. Mostly we got stuff for family members so I'm not going to spoil their Christmas presents before they get to open them!! At 3:00 a truck came and picked us up to go to the elephant riding place. You have no idea how excited I was to ride an elephant. SO EXCITED. We met two couples from Holland, one lady from New Zealand and three Chinese guys who were all riding the same truck to the elephant place. Basically this event was called a sunset elephant jungle walk. There were a ton of high platforms with stairs up to them. The platforms were built over a wire fence so the elephants were on the other side. Each elephant had a driver who would sit on their neck right behind their ears. The driver used a short bamboo stick and directed the elephant with taps on the head and small kicking motions with his feet. Steve, Me, New Zealand lady, and Kim on our elephant. On each elephant there was a wooden platform set on top of a big cloth pad on the elephants back. Everyone climbed onto the elephants in sets of four. Our elephant had me, Steve, Kim (the Asian man from our hotel) and this really jolly lady from New Zealand who was traveling by herself. Elephant driver just chilling before the jungle safari. To get into Chitwan National Park for the jungle walk, our elephant driver needed this little permit/ticket thing. The elephant walked over to the park ranger station. The park ranger absent mindedly held out the ticket, the elephant grabbed it with his trunk and handed to the driver sitting on his back. They acted like it was nothing strange but it was the COOLEST THING EVER!!!! To get into the park we had to cross a river. Normally this would be a problem, but not when you're riding and elephant!! The entire army of elephants just walked right across the river. Once they got to the jungle forrest part the elephants split up and went different routes. We kept an eye out for animals and branches. If you weren't careful the branches would just whip you right in the face, don't worry, we were careful. 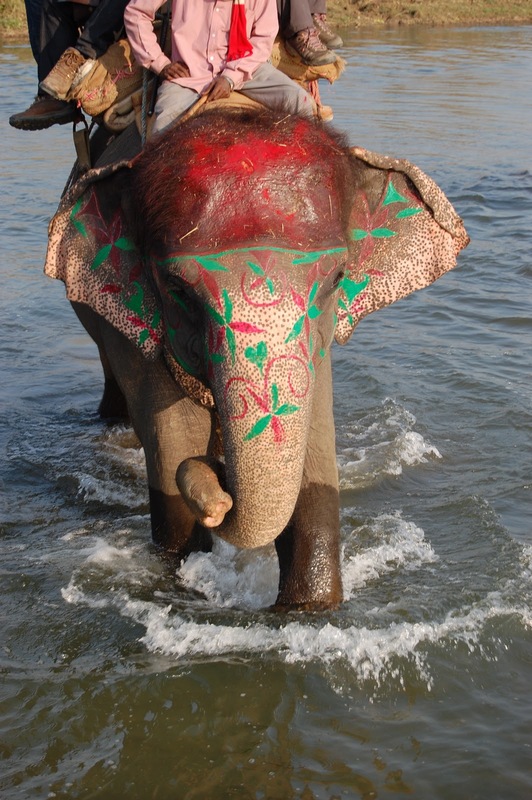 One of the beauty pageant elephants was still painted up. 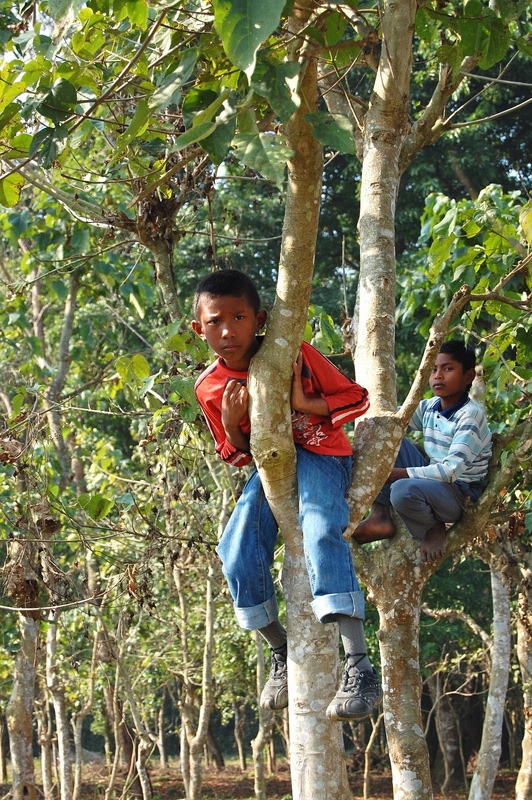 We saw three little monkeys climbing around a tree. The elephant stopped and stared at this one bush. He wouldn't walk past it. He was acting really strangely and the driver was urging the elephant to continue walking. Another elephant passed by and his driver led him right through the bush. Clearly this elephant didn't have the heighten instincts that our elephant did. Our elephant picked a different path and continued through the jungle. We decided that there was probably some super dangerous animal hiding in that bush (like a sloth bear) and our elephant was smart enough to avoid it. I guess we'll never know though. Some monkies hanging out in a tree, right in the middle on the angled tree trunk. Due to the jungle atmosphere, I thought it appropriate to sing some songs from the Tarzan soundtrack. Let me tell you, Phil Collins would've been proud. I mean it was the perfect setting for "Strangers Like Me". Steve said I had the best singing voice he's ever heard (he'll deny this comment so don't ask him). I told him, "Well, I have been called the songbird of my generation." I only wish I had some percussion back up, it would have really added a whole nother element to the music. All the elephant groups gathered around the mom and baby rhino. Our driver heard a yell from one of the other elephant groups. They had found a rhino!! Chitwan National Park is known for three main animals: the sloth bear (really dangerous can run and climb and eat you), the bengal tiger (very rare and located deep in the jungle) and the indian rhino. The driver that spotted the rhinos guided his elephant in such a way that forced the rhinos out into a grassy clearing. Suddenly the army of elephants was back together. The elephant groups surrounded the mamma and baby rhino. The rhinos just kept eating grass and really didn't seem to mind all the oohs and ahhs and camera clicks coming from their audience. Apparently riding on the elephants covers up most of the human scent so other animals are more comfortable just hanging around. We also saw deer, monkeys, birds, and tons of plants but the rhinos were by far the coolest thing. Back at the hotel Steve and I had about an hour to kill before our next activity. I went to a few shops and skype with my family in a little internet cafe. While I was skyping this one little girl kept watching me. I'm not sure she really understood why I was talking to the computer or who the people on the screen were. At 7:00 pm was the cultural program. There must have been a bus that arrived today because there were about 40 new hotel residents who were also there for the event. The program was right in the courtyard of the hotel. We sat in a circle in chairs and they gave us some chicken barbeque and a taste of locally made wine. A group of about 16 teenage boys were waiting off to the side of the courtyard. A guy introduced the dance troup and told us he hope we enjoyed the show. The dances were pretty cool. Some guys played drums and sang off to the side. The singer would sing a line and then the boys would sing the same line in response. The boys danced around in a circle with two short sticks, one in each hand. They would do steps and turns and act out a sort of fight between all of them. There was one couple dance and a guy that did really impressive flame twirling (picture at top of post). The boys doing one of the cultural dances. Clearly too fast for the camera in the night time lighting!! At the end they invited everyone to join in the dancing. Steve and I hopped right into the circle. The moves were quick but not too difficult. The only hard part was when they would just randomly switch moves and not tell anyone haha. I mainly just followed the lead of this little 14 year old boy in front of me. My dance moves were flawless so naturally they recruitted me to join their dance team....yea, not really. It was a ton of fun though. The preferred mode of transport around Chitwan consisted of shoving as many family members as possible onto one motorcycle. Thankfully we never had to try this. Dinner was buffet style and instead of it just being us and Kim there were now those 40 other guests in the cafeteria. Little bit of a change seeing so many other people around. Dinner was rice, sweet and sour vegetables, cabbage, meat kabobs, milk tea and that weird pudding stuff. Steve went to skype his family at that internet place. I showered (cold, again), climbed under those super warm blankets, set up my probably unecessary mosquitoe net around me, and wrote down the events of the busy day.